As Georgia seeks to reinvent itself as a nation-state in the post-Soviet period, Georgian women are maneuvering, adjusting, resisting and transforming the new economic, social and political order. 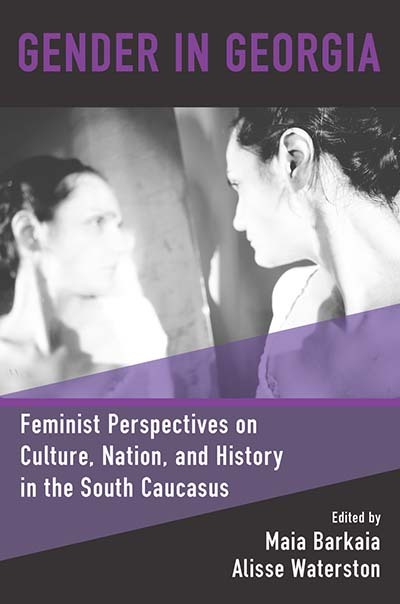 In Gender in Georgia, editors Maia Barkaia and Alisse Waterston bring together an international group of feminist scholars to explore the socio-political and cultural conditions that have shaped gender dynamics in Georgia from the late 19th century to the present. In doing so, they provide the first-ever woman-centered collection of research on Georgia, offering a feminist critique of power in its many manifestations, and an assessment of women’s political agency in Georgia. Maia Barkaia has an international PhD in gender studies from Tbilisi State University and an M.A. in modern Indian history from Jawaharlal Nehru University. She holds positions at the Institute of Gender Studies, TSU, and the Human Rights Education and Monitoring Centre. Her research examines the dynamics of student resistance and social movements in Georgia and India; her current project explores the gendered political economy of time. Alisse Waterston is Presidential Scholar and Professor of Anthropology at John Jay College, City University of New York. She is the author most recently of My Father's Wars: Migration, Memory and the Violence of a Century (Routledge, 2014). She has been an International Scholar of the Open Society Institute affiliated with Tbilisi State University (2012-2015) and is President of the American Anthropological Association (2015-2017).